Please note that the content of this book primarily consists of articles available from Wikipedia or other free sources online. 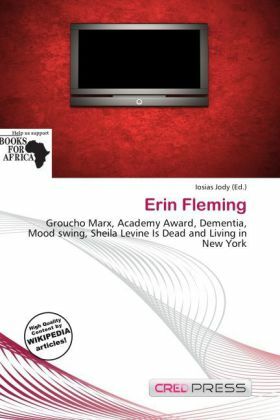 Erin Fleming (13 August 1941 15 April 2003) was a Canadian actress who was best known as the companion and caregiver to Groucho Marx in his final years. Fleming was born Marilyn Fleming in New Liskeard, Ontario, Canada. She appeared in minor roles in five films between 1965 and 1976, during which time she became acquainted with Marx and moved into his house. Fleming's influence on Marx was controversial. Many close to him admitted that she did much to revive his popularity; these efforts included a series of one-man shows, culminating in a sold-out performance at Carnegie Hall, and an honorary Academy Award that was presented to him during his lifetime. Others, including Marx's son, Arthur, described her in Svengali-esque terms, accusing her of exploiting an increasingly senile Marx in pursuit of her own stardom.